Show your pride in the Home of The Brave with the Brunswick Tzone Patriot Blaze! This ball is great for beginner bowlers or anyone that just likes to bowl for fun. I use this as a spare ball,does what I wanted to do. Exactly what I ordered. Looks great and performs as a plastic ball should.. straight! Excellent quality and value. Arrived quickly, as well. Learning to shoot a flat spare shot at the 4-7. Seems to be just what I needed. Great looking bowling ball at a very good price. After looking at the drilling size chart, I picked the large size which was a perfect for me. With my regular ball, I was almost never able to pick up the 10 pin. Now, with this ball I am picking up most all of them! What a boost this has been to my game!! Love the looks and feel of the ball. We bought this ball for our 5 year old son - he loves it!!! He is able to hold it correctly with his fingers and throw it down the lane!! We take him to our local bowling alley and he bowls at least 7 to 8 games at a time. When he is ready for a heavier ball we will definitely purchase through bowling.com again. Great ball! Got it to pick up the 10-pin as well as other single pin and combo spares. Strike balls are so aggressive today and very difficult to throw cross-lane without breakage. This ball does what I need it to do; it is DEAD straight even when you try and hook it. Now, I would love to try it in a sport shot league...I'll update if I ever get the chance. Love my first bowling ball. Just started bowling about two months ago. It's great fun. Got the Brunswick TZone Patriot Blaze and really enjoy it. Average is about 132. Feels good, good control, love it. Having fun! By dub from El Dorado, Ks. Bought it for a friend who was throwing his finger tip ball at the 10 pin and missing most of time. His average has gone up 12 pins in the first month with this spare ball and he's picking up about 80% of his 10 pin spares now. In practice it is doing want I wanted. Great! I have been out of bowling for over 25 yrs and I have been bowling in a fun league starting last year and used a house ball so I bought this ball for this year and have improved my average by 25 pins. It is a great ball for me. I had to drop my weight of ball to 10 lbs and am very happy.Would buy this ball again. I bought this because I started bowling on a league again after a 3 year absence. I have always been a "straight bowler" never really throwing with a curve. I have also been bowling for over 35 years so I do have some experience under my belt. First time I threw this ball I got a strike! Feels great and the balance is wonderful. If you are looking for a great ball at a killer price..... This is it! Makes me feel very patriotic. Love my ball. I wanted a ball that would improved the accuracy in making the ten pin - so far this one not working. Great price for what you get. I took this ball out for the first time and it felt perfect. This ball does exactly what I wanted it to do. I will never stop using this as a spare ball! I use the T-zone as a spare ball and it works great! I can pick up the 10 pin so easily now. 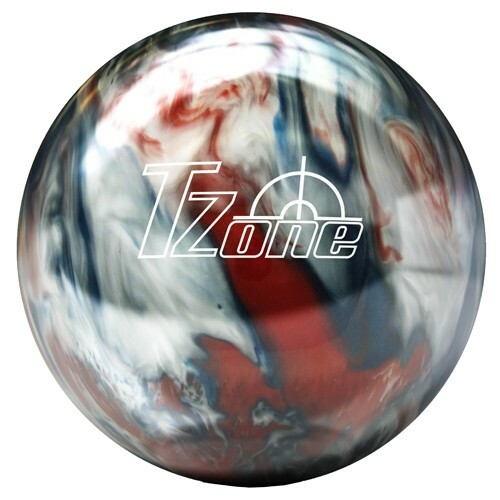 When I first started bowling I used a T-zone as my strike ball. It has just enough to be the best ball for beginners. I loved it! I loved bowling but was always mad because I rarely broke 100. I decided to buy my own ball after reading up on bowling, and since I wear a wrist brace and throw straight, due to an injury, I wanted a ball with low hook. With this ball and once a week practice this summer, I went from hoping to break 100 to always breaking it. Today I scored a 148. Picking up spares so well it's hard to believe. I went out of town and took the ball, the lanes there were very oily, yet I still did well after towling it off frequently. Ball gets at least 8 pins every pocket hit. My husband wanted this ball. He seems to be happy with it. No problems so far! All of the Brunswick TZone balls that we sell are made out of hard plastic. How do u know what size u need ball drilled to? Good Question! Under the price it will say "Drilling w/ FREE Protection" to the left of that it will say "Details" and that will give you the measurements for drilling. 4 of 5 customers found this answer helpful. Did you? Yes | No Did you find this answer helpful? Yes | No Thanks for your feedback! Yes, this ball will bowl straight. 1 of 1 customers found this answer helpful. Did you? Yes | No Did you find this answer helpful? Yes | No Thanks for your feedback! I am a lefty with a 160 average and throw a Columbia scout finger tip. I am looking for a spare ball for the 7 pin. Will this ballgown straight if drilled the same as my scout or do I need to have it drilled different? Hello Bill! Yes, this would be a perfect ball for you! Any plastic/spare ball will bowl straight. 1 of 2 customers found this answer helpful. Did you? Yes | No Did you find this answer helpful? Yes | No Thanks for your feedback! Can I hook with this ball ?? Hi! The Patriot Blaze is a plastic/spare ball and will only bowl straight. We offer pre-sized basic drilling (XS-XL) for $14.95, but if you are looking for custom drilling you would need to go to a local pro shop. This ball is best for all ages! 2 of 2 customers found this answer helpful. Did you? Yes | No Did you find this answer helpful? Yes | No Thanks for your feedback! Hello! Plastic/spare bowling balls are good for bowling a straight shot. Yes, this is a plastic/spare ball. im just beginner so i need a hook ball, what ball should i pick? We recommend going with an entry level ball so you can learn how to hook the ball. The Brunswick Rhino line is a very good entry level series. Hello, I am first time bowling ball buyer.. lol Where do I get them drilled? You can either have us drill it for you or you can take it to a local pro shop and have a driller drill it. All the TZones will perform the same way for they are all plastic/spare balls. Due to the time it takes to produce the Brunswick TZone Patriot Blaze ball it will ship in immediately. We cannot ship this ball outside the United States.